This summer Conservation Parks is giving away up to 1,867 one-year memberships to celebrate Canada’s 150th anniversary of Confederation. 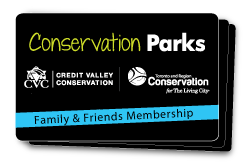 Enter online to win a one-year Conservation Parks membership. Contest runs from April 29, 2017 to September 29, 2017. See full contest details and rules for more information. Only ONE prize will be issued per email address. ENTER HEREContest runs from April 29 - September 29, 2017.